Need a test email address is really existing software? 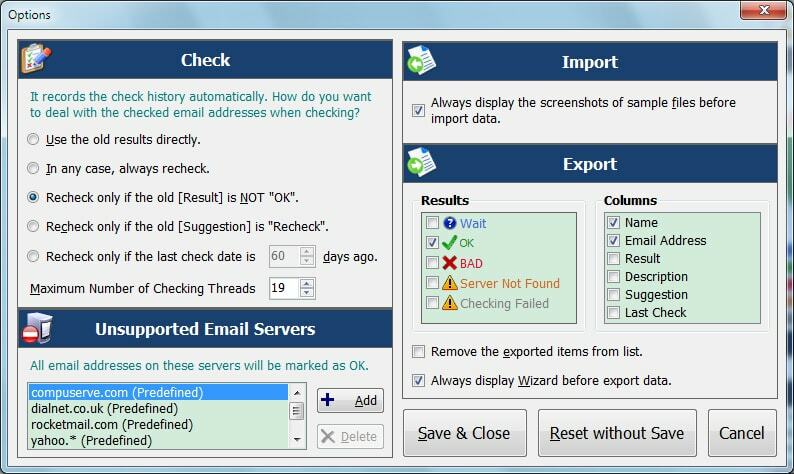 Just try Email Checker Pro! Do you have an email addresses list? Maybe some of them are invalid or nonexistent on the email servers. The nonexistent email addresses will increase your management costs and cause many bounce sendings. So, you may need a test email address software to make your email listing to be clean and valid. Congratulations! You can get a convenient and powerful test email address application now at here! It can validate email addresses are existing or not. You can import your email listing from .csv/.txt/.xls/.xlsx files. It validates email address without sending any messages. Multithreaded mode to keep it has the fast validating speed. Real-time visual statistics during validating. Allows you to output the tested valid email addresses. 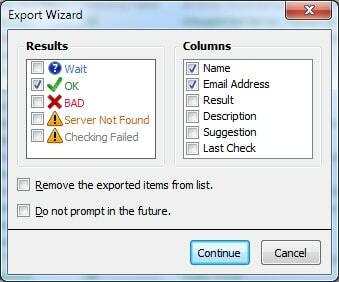 Some useful settings for validating, importing and exporting. Click <Check> button to validate email addresses. Once done, export the valid email addresses to csv/txt/xls/xlsx files. You can see all above introductions in following screenshots of our test email address tool. Do not hesitate, just download our test email address application now! It’s 100% clean (guaranteed by SoftPedia).